Fantasy Football might be the only non-football part of football more popular than the NFL Draft. Does that make sense? Yeah, that makes sense. Matthew Berry from ESPN has long been my favorite fantasy writer/podcaster and an influence of mine. Berry is a man of many “bits”. “Love/Hate”, “10 lists of 10”, “Factually correct”, and his “Draft Day Manifesto” are just a few of the long running pieces and gags you can find in his writing as well as his long running podcast(s). The bit I’m going to respectfully swipe from Mr. Berry on this Packers Football Friday is “flag guys”. In fantasy football these were guys that Berry would wave the flag for, or plant his flag by, I don’t know. It had something to do with flags. The point is that these are the guys that he wants to be judged on at the end of the season. These are the guys that he’s higher on than everyone else and if they’re good, he did a good job of forecasting. If they’re not, that’s on him, too. So I’m going to go through a few of my “flag” guys in the 2018 NFL Draft. You’re welcome to come back at me in four years and evaluate my work. Jackson gets a bad rap because of his 40 time of 4.56 at the combine and 4.52 at his pro day. For some reason that erases his unbelievable 2017 film. Jackson is the best playmaker in this class, and on top of that allowed the lowest passer rating against in the FBS. He’s a playmaker who also limits his opposition’s ability to make plays. 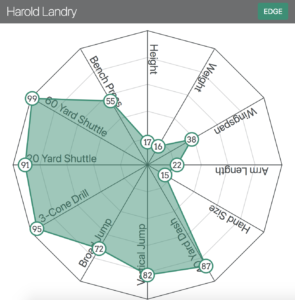 Landry struggled through an injury plagued season in 2017 and it has depressed his draft stock. When one turns on the tape from 2016, they will find the best single season from a pass rusher in this class. Landry is flexible and athletic. His 3-cone time of 6.88 is in the 90th percentile for EDGE athletes. He’s a freak, and he’s a skilled freak. He is my #1 overall player as far as Green Bay’s needs are concerned. Gallup’s main concern is that he’s not an elite athlete. He’s a good enough athlete, though and a really, really good football player. His footwork and acceleration is all so smooth. He reminds me of Davante Adams. This year’s class of receivers is not great, but Gallup is a player that I firmly believe can be a full time starter at the receiver position. He might never be a star, but Davante Adams is a star. They need a complementary piece. Pettis is the deep threat that the Packers need. He’s a fluid athlete and a hands catcher. These are two things that are of paramount importance. I see a little of Reggie Wayne in Pettis. He understands route leverage. Smart football player. Dante Pettis sent me some of his favorite plays of the season. His route running and ability to adjust on the fly is ridiculous. Smith is an absolute athletic freak. He’s a guy who’s played guard and tackle and possesses all the athletic upside in the world. He’s a Packers-type offensive lineman that I would have no problem taking in the 2nd round of the draft. I view him as a long term above average starter at the guard position that can fill in at tackle in desperate situations. Nwosu is the versatile weapon that the Packers defense currently has in Clay Matthews, but could certainly duplicate. Nwosu is a FORCE player, per Justis Mosqueda’s numbers. He also has strikingly similar measurables to Khalil Mack. Is Nwosu Mack? Probably not but he’s a long term contributor against the run and pass. DeLuca struggled in Indianapolis after an up and down week in Mobile. His tape, though, especially prior to knee and shoulder injuries, doesn’t lie. DeLuca was a dominant force at NDSU. Bison pros also have a very low bust rate. Joe Mays, Ramon Humber, Joe Haeg, Kyle Emanuel Carson Wentz and UDFA’s CJ Smith, Marcus Williams and John Crockett have all achieved above and beyond their draft status (or undrafted status). Not all are stars, but each player has stayed and produced in the NFL at a level beyond what would have been expected of that draft slot. A star? No. An excellent special teamer with the upside to be a serviceable starter in round 5? Yes please. Nick is one of the better natural cover linebackers in this draft and a capable pass rusher. 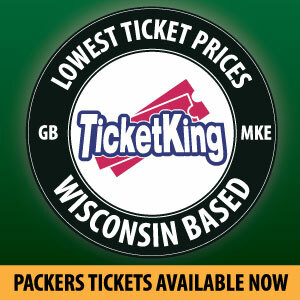 PACKERS FOOTBALL FRIDAY: Who's Playing the Z? This entry was posted in Authors, NFL Draft, Ross Uglem and tagged Braden Smith, draft, Harold Landry, Joshua Jackson, Nick DeLuca, Packers, Ross Uglem, Uchenna Nwosu. Bookmark the permalink.